Today, you can certainly talk about a rustic kitchen that is both authentic and efficient. With its warm and authentic look, homey feel and beautiful natural wood - the rustic kitchen is the perfect choice for anyone who believes that the heart of the home is the kitchen. Yet, some people are still apprehensive of rustic design in the kitchen because of the erroneous myth that rustic kitchens are not functional enough, especially compared to modern kitchens. As you can see in this article, that is nothing more than a misconception. Today, you can certainly talk about authenticity, the connection to nature and the warmth of rustic kitchens, and in the same breath talk about the convenience and efficiency of these kitchens. If your favorite design style is rustic, but you don't want (and quite rightly so) to forgo the comfort of a modern kitchen, here are some professional tips that will teach you how you can enjoy the best of both worlds. "Rustic design is the final dress fitting," says interior designer, Orly Cohen. "We dress the modern kitchen in a rustic look". The actual interior of the kitchen, starting from the hardware, the structure of the drawers and shelves, through to the arrangement of storage spaces, is as modern as it gets. Also, in the past the drawers in rustic kitchens were not as wide in comparison to modern kitchens and their storage capacity was smaller, but thanks to proper planning, now you can find a solution and a place for everything in the rustic kitchen. I go over every detail in the kitchen with my clients, paying attention to every element. Which means, the serving bowls, the pots, storage of the good cutlery that is only used on special occasions. Every item gets its own place during the planning stage. It is very important to delve into details when planning a kitchen". How do you approach planning a new kitchen? "One of the first things I do is take a look at the client’s conduct in the previous kitchen, including problems that inhibited cooking, storage or hosting. The objective is to adapt the new kitchen to fit perfectly with the clients' needs. I suggest that my clients give thought to their future needs, the kitchen will serve them for many years to come. If, for example, a young couple is thinking about not including a dining area, I explain that they might have kids in the future and this means family meals. I ask my clients to look at least ten years forward, it is really inconvenient to replace a kitchen when you are living in a house and that's why we plan the kitchen for the long term". Architect Einav Galili agrees that in rustic kitchens modern innovation can be seen mainly in the interior areas. "In my eyes, the rustic look is the best look for a kitchen. Because rustic design doesn't belong to a certain trend , it never gets old. 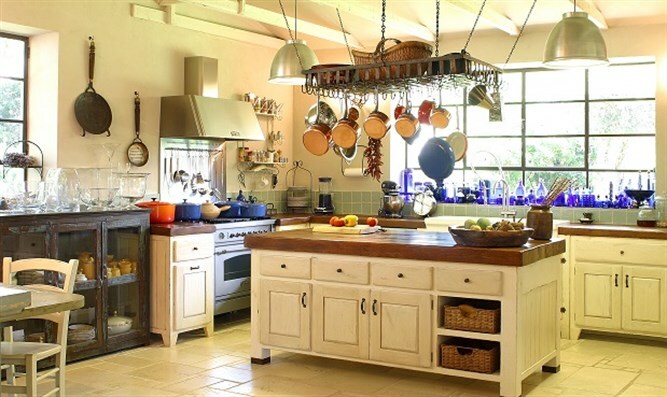 Rustic kitchens impart a feeling of warmth, coziness, and a feeling of intimacy. There is definitely modernity in rustic kitchens, it is just hidden from the eye, such as: drawer tracks, the internal division of the drawers and cabinets, the openness of the various pieces of furniture and more. "The design style doesn't really make a different to me when I start planning a kitchen. The important thing is to plan the kitchen according to to its main functions, such as: the sink, the fridge, the oven, the dishwasher, the microwave.... and all the rest of the electrical appliances in the kitchen. I give my clients a methodical list on which they write down exactly what they want in their kitchen and the dimensions of every appliance. This is a very important stage for me as I don't want to get to the stage when the kitchen is finished and suddenly we find that there's no space for a toaster. Then, I make sure that there are enough work spaces, storage space and place to host... all according to the clients' specific needs. To me it's important that the kitchen works well, in other words, if there is a coffee machine I'll put the water dispenser next to it. I will plan the sink next to the stove so that the person who is cooking won't drip water all over the kitchen floor, and things like that". As a designer who has been planning rustic kitchens for many years, have you seen a change in the design style? "Even rustic design style has trends. For example, recently I have seen changes in kitchen colors, there is a greater openness to new colors. I have been planning more kitchens in shades of blues and greens and fewer white kitchens. I think that the touches of color work beautifully on the natural wood. In addition, you can see how the eclecticism in the materials is also entering the rustic kitchen, for example, iron frames on wooden doors, concrete floors in the kitchen, and combinations of stainless steel and brass. I really like to combine materials from different worlds, and as far as I'm concerned, there are no rules, not even in the rustic kitchen. The idea is that the materials should all talk the same design language". Interior designer Ronlee Rosenblum says that she really loves the rustic style because it brings out the essence of the kitchen - family warmth. According to her, the secret to rustic design lies in the proper planning, according to the family's functional needs, with the small items complementing the decor. "With the rustic design style no one piece of furniture is similar to another. The descent into detail is reflected in examples of cabinet doors, legs of the furniture, and the different pieces of hardware. The small nuances make all the difference. In the rustic kitchen the carpentry work should be very meticulous and every element in the kitchen is produced perfectly in synch with the space and the clients' needs. What, in your opinion, are the most important things when planning a kitchen? "Good kitchen designing takes into account the ergonomics and the needs of its users. It is important to thoroughly examine the family's needs and lifestyle. It is important that clients carefully prioritize their needs and desires from the beginning and that there is storage space for each item in the kitchen, according to its size, weight, and frequency of use. In the dining area, on the central island, it is advantageous to create comfortable seating that allows eye contact between the diners - which contributes to a relaxed atmosphere during meals. The kitchen should be comfortable and practical for maintenance and cleaning, so it is very important that the area between the sink and the stove is as large as possible, there shouldn't be divisions between the different sections of the work area, such as a combined oven or sink placed in a way that makes it difficult to clean around the work area. No matter how big the work space is, there is never enough room for all the small kitchen accessories, and the way to solve this problem is to create a wide window sill that gives us an area that is separate from the work area. 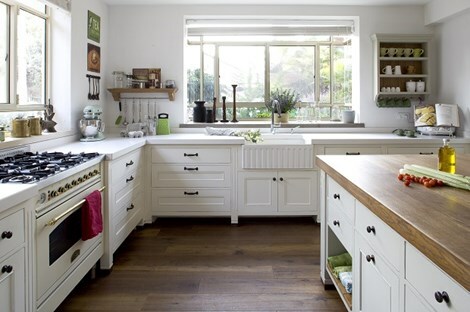 This area is easier to maintain and clean and adds to the general rustic atmosphere of the kitchen. "Compared to modern style kitchens rustic design gives us a wide range of design options. You can choose colors in different shades, there is a wide variety of woods and different processed wood products, a large selection of handles, and therefore the rustic style allows me to incorporate all of the clients' dreams into the kitchen".